On February 18, 1918, a dozen men gathered at the Old Kimball House in Atlanta to found and organize a new service club, the first of its kind in Georgia. 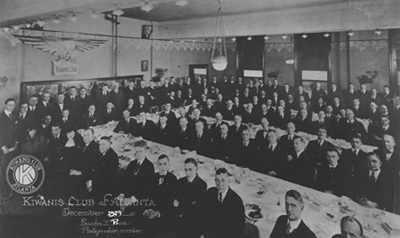 When a charter was later presented on June 11, 1918, 43 Atlanta business professionals stood up, accepted membership, and became the Kiwanis Club of Atlanta. The Club grew quickly after its founding to become one of the premier clubs in the national Kiwanis family. It numbered over 200 members by 1920 and has remained one of the larger Kiwanis clubs internationally ever since. For its first project in 1918, the Club promoted the sale of World War I Liberty Bonds. Today the Club sponsors a broad range of projects in many fields with the majority of projects being classified in the youth services or vocational guidance areas. The Kiwanis Club of Atlanta is the "Mother Club" of the Kiwanis International Georgia District. From the Club's initial seed in Atlanta there now exist over 190 Clubs in the Georgia District which provide a broad range of community service to the cities and counties of Georgia. Over the ninety plus years of its service history to the Atlanta metropolitan area, the primary goal of The Kiwanis Club of Atlanta has remained the same - "To be the premier downtown civic club where a diverse membership of current and future leaders serve their community, meet regularly to hear prominent speakers, and enjoy genuine fellowship in a welcoming gathering place." 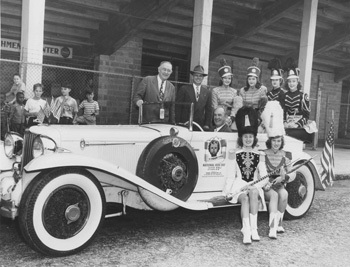 For a list of the Past Presidents of the Kiwanis Club of Atlanta since 1918 - CLICK HERE!